As a mother and a veteran educator, I am dedicated to nurturing the strengths of kids, teens, and adults with challenges through fun lessons, classes, and social groups that emphasize learning, developing, and refining cool skills. In addition, I strive to help strengthen family relationships by offering these fun resources to friends and family of our challenged students. I have hands-on Applied Behavior Analysis (ABA) experience. I've run a Little Gym, and have taught at prestigious private schools. I'm effective at teaching kids who struggle to learn cool skills in a regular class--because of their personal challenges like autism, ADHD, vision impairment, etc. I teach acting, acting improv, karate (black belt), tae kwon do (black belt), singing, tap dancing, ballet, jazz/hip-hop, guitar, voice-over acting, and social skills role playing. I have a degree in musical theatre, and extensive training and professional experience in all these pursuits. With over 25 years of teaching experience under my belt, I launched the Cool School because nothing makes me happier than teaching this stuff to people of all kinds and ages. Do you think you and/or your child might get a charge out of dancing, kicking a board in half, singing, or strumming out a familiar song on guitar? Contact me. I currently have a couple of openings. 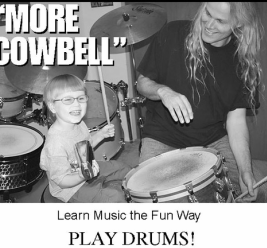 How about some cool drum lessons? Ned is here for you. I'm Ned. I'm a behavior mod guy. I understand that my drum students must become drummers whether they have much practice time or not. Kids and adults are busier now than they've ever been. If you're super busy, what you need is a fun teacher who can make you into a drummer on the spot, not a typical assign homework, then test, then scold drum teacher. You and I will grade my performance on how much I can help you improve during your lesson. I'm always accepting of whether you have or have not practiced. And you will improve a lot studying with me, even if you don't practice much. After 3 to 6 months you'll be ready to play in your first basic rock band. You can't skip lessons certain weeks because you didn't get to practice. Attend and improve! Robyne teaches Karate and Martial Arts classes and private lessons at The Cool School, and has taught karate classes at The Little Gym, as well as cardio-kickboxing classes at True Martial Arts. She teaches dance classes at Premiere Dance Center in Redmond, and has taught dance classes for several other studios in Issaquah, Sammamish, and Bellevue. She runs improv workshops for families, corporations, schools, and comedy productions. 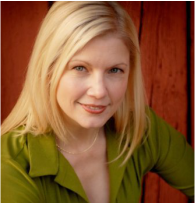 She teaches guitar lessons, and teaches voice lessons and does vocal coaching. Robyne plays guitar and sings professionally many places with many groups including the local Americana band, EveryLeaf. She loves working with kids and adults on the autism spectrum, and has hands-on ABA experience to help with that. I’ve been an Applied Behavior Analysis Aide working with autistic children extensively. I apply those skills to my teaching.